This groundbreaking book shows how to increase funding for social justice philanthropy. Social justice philanthropy provides direct services to alleviate suffering and works to transform the systems and institutions that cause that suffering. 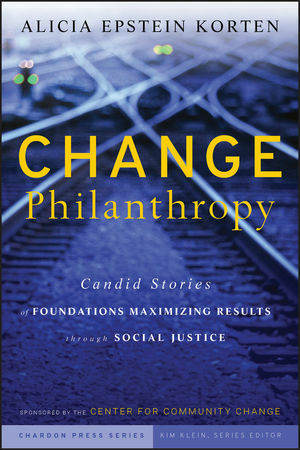 Written in an engaging, easy-to-read style, Change Philanthropy offers an insider's view what works and what doesn't work when developing grantmaking strategies in support of social change. 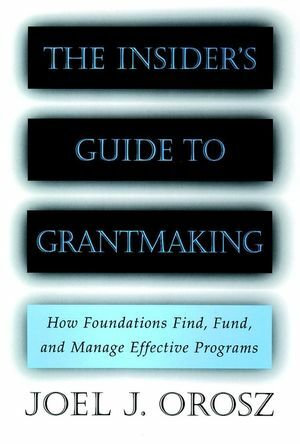 It gives clear guidance showcases foundations of all types and sizes including Liberty Hill Foundation, Charles Stewart Mott Foundation, Needmor Fund, Jacobs Family Foundation, Discount Foundation, Global Fund for Women, Schott Foundation, Ford Foundation, and the Open Society Institute. The book also includes a wealth of illustrative examples and contains practical suggestions and tips that can be applied immediately to support any social justice agenda. The Author Alicia Epstein Korten is the CEO of ReNual LLC, a consulting firm that supports foundations, nonprofit organizations, and socially responsible businesses with strategic planning and publications. She is a contributing author to Wake Me Up When the Data Is Over from Jossey-Bass. Foreword (Christopher Harris, Deepak Bhargava). PART ONE: Securing Success with Campaigns. 1 Strengthening Unusual Alliances for Living Wages. The Case of the Discount Foundation. 2 Supporting Citizen Action and Litigation for Education Reform. The Case of the Schott Foundation. PART TWO: Infl uencing Market Forces in Support of People and the Planet. 3 Using an Endowment to Build the Field of Socially Responsible Investing. The Case of the Needmor Fund. 4 Transforming Business Structures for Communities. The Case of the Jacobs Family Foundation and Jacobs Center for Neighborhood Innovation. PART THREE: Aiding an Identity-Based Movement. 5 Supporting the Development of an Immigrant Rights Field. The Case of the Ford Foundation. 6 Maturing an Immigrant Movement. The Case of the Open Society Institute. PART FOUR: Creating Infrastructure for Justice. 7 Building Community-Based Power in Los Angeles. The Case of the Liberty Hill Foundation. 8 Strengthening National Community-Based Networks. The Case of the Charles Stewart Mott Foundation. PART FIVE: Transforming Funder-Grantee Power Relationships Through Creative Foundation Structures. 9 Addressing Internationally Women's Needs for Funding. The Case of the Global Fund for Women. 10 Responding to Disaster Recovery and Beyond. The Case of the Gulf Coast Fund for Community Renewal and Ecological Health, a Special Project of Rockefeller Philanthropy Advisors. PART SIX: Gleaning Lessons for Change. 11 Lessons for the Road. Afterword: Race and Social Justice (Maya Wiley). A Words You Need to Know to Read This Book. C Ten Questions to Consider Asking Inside Your Foundation. D Where to Turn for Next Steps.